The Vimel pen voice recorder is best in both style and functionality. It has a slim and smooth professional design, which is packed with advanced features. This remote control wire included and earphone allows you to playback your recordings directly from the pen. Vimel pen voice recorder is perfect for recording lectures as it has a very powerful microphone (tiny voice recorder). The ALC (automatic level control) which automatically adjusts the microphone power depending on the distance of the sound source. The two modes of recording are continuous recording mode or voice recording mode. 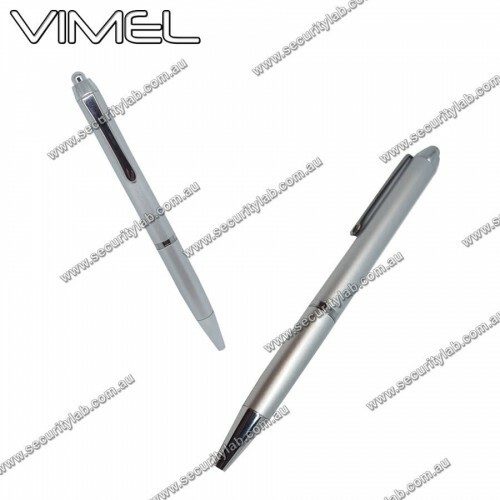 This Vimel pen has a secret activation switch and a very sensitive internal microphone to capture even the unclear sounds. It comes along with internal long-life battery and charges it from the USB port of the computer and it helps you to record up to 15 hours. It is perfect for all day seminars where tape recorders are not allowed. It comes with a complete wired control and headphone playback. For an instant review of the footage, simply download the recordings to your PC. This pen can be used for many purposes. If you are required to take down notes but you cannot carry any cameras for a business meeting or lecture time, then you can use this voice recorder pen which is really beneficial. There is a real need for various spy gadgets in many different environments and applications. When you are in need of making evidence you can use the spy hidden cameras for recording. Spy gear pen voice recorder is one of the better-known spy pens available in the market. It is a versatile device that can create that capture the audio track compatible with most digital devices. It might be a guy thing, but gadgets are just cool, spy gadgets are even cooler. Surveillance – security with precision using spy penHigh tech audio video recording spy pen c..